I created oven roasted green bean fries by accident intending only to roast them, but in waiting for the chicken to finish grilling, I thought it would be safe to turn off the oven and leave the beans in the oven to keep them warm. Well, to my surprise, they kept warm, but also became crunchy like a French fry or wonderfully flavored chip. I searched the internet to see if the creation already existed … well it does and although I am not the original creator, I am pretty darn excited about making these again. Wash green beans in a colander, rinse, and pat dry with paper towels. Place in a bowl with 1 or 2 tablespoons of olive oil and coat with hands. Place green beans on large baking pan, making sure they are evenly spread out, and none are lying on top of each other. Sprinkle seasonings and Parmesan cheese evenly over green beans. 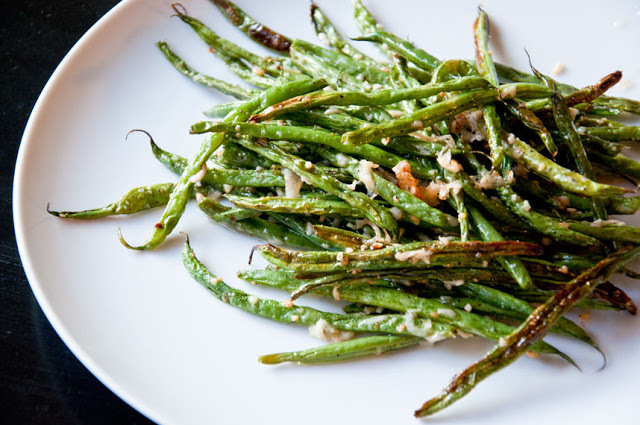 Place green beans in the pre-heated oven and bake for 10-15 minutes, or until golden brown and crispy. Turn with a spatula about ½ ways through cook time and keep the beans spread out. Mine came out extra crispy by turning off the oven and leaving them for an additional 15 minutes.